Homemade vinaigrettes and salad dressings are fun recipes to play around with at home. I love to recreated my favorite restaurant dressings so we have them all the time. This Creamy Roasted Garlic Dressing is especially good on pasta salads or smeared on a club sandwich. Greek yogurt is rich, creamy base that works perfectly with the roasted garlic in this recipe. Roasted garlic is a magical ingredient that adds a TON of flavor to your favorite dishes. Unlike raw garlic which can be very strong with a sharp bite. Roasted garlic is sweet, mellow, and smooth. We love to spread it on a fresh baguette, add it to quick pasta sauces, and use to it make recipes like my Creamy Roasted Garlic Dressing. It is super easy to roast several heads at once. Then I just peel them and discard the skins. After that store them in a jar lightly covered in oil to keep the cloves nice and moist. You can also buy roasted garlic from your supermarket deli. It’s typically with the marinaded olives and other antipasto items in the self-serve area! Either way you need to keep this miracle ingredient on hand! Trust me! I hope you like my Creamy Roasted Garlic Dressing as much as the crew does. 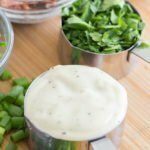 If you love this delicious salad dressing recipe, you can find more like it by checking out my Dressing section! For recipe inspiration delivered to your inbox, subscribe to my newsletter, follow my photography journey on Instagram, and for generally inappropriate humor follow like me on Facebook! 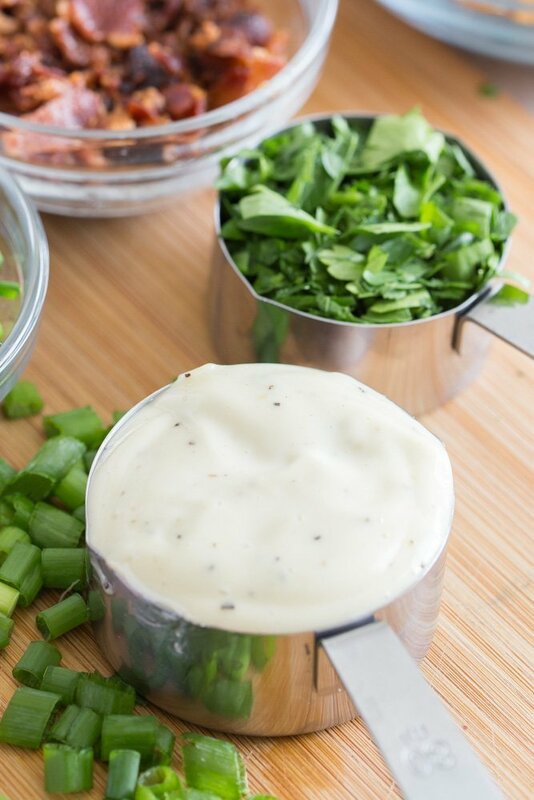 A rich dressing made from roasted garlic, Greek yogurt, fresh herbs, and a hint of fresh black pepper. Perfect on salads, sandwiches, and wraps. Combine all ingredients together in a blender or food processor. blend until smooth. Salt to taste. Store dressing closed in an airtight container in the refrigerator for up to 2 weeks. Tip - Follow these easy directions to make Roasted Garlic at home.